China has entered a “New Normal” phase and faces the heavy task of transforming and upgrading as well as technological innovation. Meantime, the constraints of resources, laborers and environmental capacity have become more severe, and the international environment for China’s development shows some negative changes. In face of all this new international and domestic situation, China’s reform and opening up may need some alterations. It is crucial therefore, to make an objective and comprehensive assessment of China’s losses and gains over the forty years of reform and opening up, and to provide theoretical references for the nation’s policy-making. The Four Decades of Innovation of Economic Theories in China by Zhang Zhuoyuan, Hu Jiayong and Wan Jun is a timely response to this demand. This book reviews the formation and evolution of the economic theories of socialism with Chinese characteristics. It analyzes its principal pillars, basic characteristics and the disciplines that it covers, aiming to explore the implied structure, basic rules and developmental directions. This new book makes a comprehensive review of the evolution of the economic theories of socialism with Chinese characteristics by illustrating the economic theory of the socialist market, the primary stage theory, the theory of basic economic systems, the income distribution theory, the theory of macroscopic readjustment and control, opening-up theory, the theory of economic development and other theories. It depicts the structure of thought and academic contestation behind the development of these theories, and provides convincing and compelling theoretical judgments about the major pillars and threads of the theoretical system. 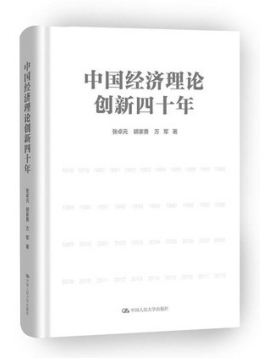 The new book points out that the premise that China is in its primary stage of socialism is a general and fundamental judgment about China’s national situation, made from the perspective of the nation’s economic and social nature as well as the developmental phase of China’s society. Marketization is the main thread of thought for the economic theories of socialism with Chinese characteristics. China’s reform and opening up began by introducing market mechanism into economic activities. The deepening and development of the economic theories of socialism with Chinese characteristics is carried out on the basis of marketization reform. The most remarkable characteristics of the economic theories of socialism with Chinese characteristics come from the reform and opening up process. The nation’s economic reforms are carried out progressively, and the economic theories of socialism with Chinese characteristics continue to develop through progressive reforms. China’s reform and opening up aims to release and develop productive forces and eventually achieve common prosperity. The book proposes that the law of value as well as the law that the fruits of development be shared by the people should be considered as two fundamental laws of the socialist market economy.